You're the kind of person who knows how to create an air of mystery. You're the kind of person who might saunter out of the fog on a moonlit night just as a couple asks, "What was that?". No doubt you'd say something ambiguous with a fedora in front of your eyes. No matter how you feel about fedoras, they are the mandatory uniform of mysterious people on foggy nights. Now, there are a few things that make people more enigmatic. There are wigs and there's the color purple. So it's fair to say this wig can be one of the most esoteric items in your closet. Pretty good fit for a mistress of mystery! This black wig is straight on top and cascades down into curls for a gorgeous bouncy look. 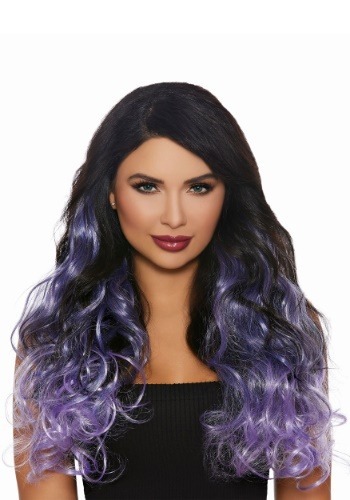 The violet color curls, intertwining with the black at the bottom for an ombre look. Whether you are hoping to reign as a ruler of mystery or you simply want an awesome costume for Halloween or any other special event, you'll love having this wig on hand. And hey, if you put together a truly awesome ensemble, feel free to leave a review. We're very generous with bragging rights.